CARACOL, Chiquibul–A week and a day after the brutal murder of Tourism Police special constable Danny Conorquie on Thursday, September 25, at the Caracol ruins inside the Caracol Archaeological Reserve, the protected area was the site of an armed attack against Belize Defence Force (BDF) soldiers and a team of carpenters by an armed mob of about 40 Guatemalans last Friday, October 3, who threatened to burn down the new conservation post the Belizeans are erecting to stem the unrelenting tide of illegal incursions and encroachments by Guatemalans. 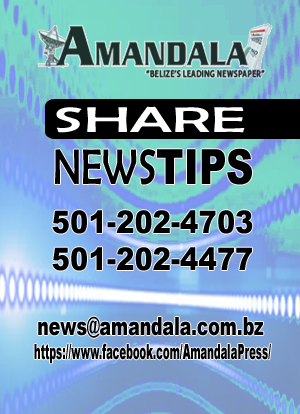 Ret’d Colonel George Lovell, Chief Executive Officer in the Ministry of National Security, told Amandala that military reinforcement was called in to support the four BDF soldiers who were onsite. Lovell said that the BDF never retreated, but held their ground in the face of threats from the Guatemalans – who carried rifles, machetes and shotguns – that they would burn the conservation post down. Rafael Manzanero, Executive Director of Friends for Conservation and Development, the NGO which co-manages the adjacent Chiquibul National Park, told Amandala that the group consisted of about 40 armed men from La Rejoya, Guatemala, who threatened to burn down the badly needed conservation post at Valentin Camp, Cayo, in one of three priority hot spots for illegal activity by the said Guatemalans. The nearest conservation post to that location is Tapir, which, he said, is right on the very tip of the Chiquibul National Park. Speaking with journalists in Belize City on Friday, Prime Minister Dean Barrow said that it is outrageous that these Guatemalans, even after coming over to Belize to “do the horrible damage that they do to our resources,” would be so “facey” as to try and stop Belizean authorities from trying to establish a conservation post to protect Belize’s national territory. “Well, that’s not going to happen. The BDF will do what it has to do, but really, I think it is high time that the Guatemalan authorities step up and discharge their responsibility,” Barrow said. Barrow said that Belizean officials had contacted their Guatemalan counterparts to urge them that they need to get a handle on the Guatemalan villagers, to avoid an incident that could result in the spilling of blood. 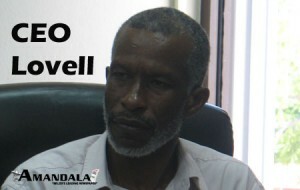 Lovell told Amandala today that Belize’s call is clear: that the Guatemalan authorities are being asked to keep the villagers out of Belize and to dissuade them from crossing over into Belize to haul out illegally cut timber and from making fences for farming in areas which are clearly within Belize. Manzanero told us that building materials were moved to the site on Thursday, October 2, 2014, and the threats by the Guatemalans were an immediate reaction to the commencement of works at Valentin. Guatemalans use the Valentin area for illegal farming of corn as well as pumpkin (for pepitos) and beans, and they also use the area as an entry point for illegal loggers, Manzanero explained. Survey lines have also been put down for quite some years, and the FCD has been recommending that the Lands Department visits the area to address the situation on the ground. Guatemalan farmers presumably put down survey lines to try and demarcate areas inside the Caracol Archaeological Reserve where they intend to farm the following year. Those plots have been cut and planted out in the hope that rains will soon come. Manzanero said that the Guatemalans are currently in that phase of preparing the fields, and the situation, he says, might have become even more dire due to the losses experienced on the Guatemala side of the border due to drought conditions there. But Colonel Lovell insists that Belize cannot allow these activities to continue and it cannot allow Guatemalan civilians to accost Belizeans at its conservation posts. The CEO confirmed that there have been several incidents similar to Friday’s flare-up at Valentin, which have generally erupted after Belize Defence Force officers detained and arrested Guatemalans engaged in illegal activities near the border, close to the populated centers in Guatemala. “They try and mass to get the individual released. We have had incidents where Guatemalans were shot and these people would mass and to avoid conflict, so we would move the body,” Lovell recalled. At the request of Guatemala, delegations from Belize and Guatemala are planning to meet in the days ahead on their home turf, as Belize’s new Ambassador to Guatemala, H.E. Alexis Rosado, officially takes up his post in that country’s capital, to succeed the late Ambassador Alfredo Martinez, who passed away earlier this year. The meeting is apparently an attempt to diffuse cross-border tensions, triggered by efforts on the Belize side of the border to push back escalating incursions for illegal logging, gold panning, hunting, and other such activities, being carried out as part of multi-million-dollar operations by Guatemalans, primarily in Belize’s protected areas in Cayo and Toledo. We asked Colonel Lovell what the current posture of the Guatemalan government is, in the wake of the incidents which have unfolded over the recent weeks. 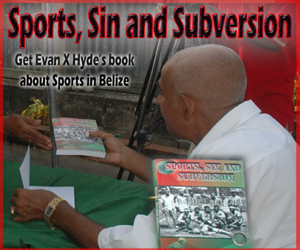 “They are in fact under severe pressures from their people because of Belize’s stand and what was mentioned in [the] media,” said Lovell, adding that the hope now is that the upcoming official meeting will yield some positive resolutions on the way forward. Lovell said that it was the Guatemalans who called for the meeting. We asked him if there are any issues with it being held on their home turf, and Lovell said that he has none. Meanwhile, Belize officials have confirmed that Belize and Guatemala are about to sign 15 new agreements, which have yet to be disclosed. We asked CEO Lovell if any of them have to do with security issues, and while he indicated that he has not seen any draft agreement in this regard, he assumes that because of the high priority which security now commands, it will be covered under the agreements. Meanwhile, Belize will continue with plans to set up three new conservation posts out west. Manzanero told us that by the end of the month, the post at Valentin should be fully operational. He said that the post will require the presence of Belize Defence Force soldiers as well as rangers or wardens from the Institute of Archaeology, under a multi-institutional support program. 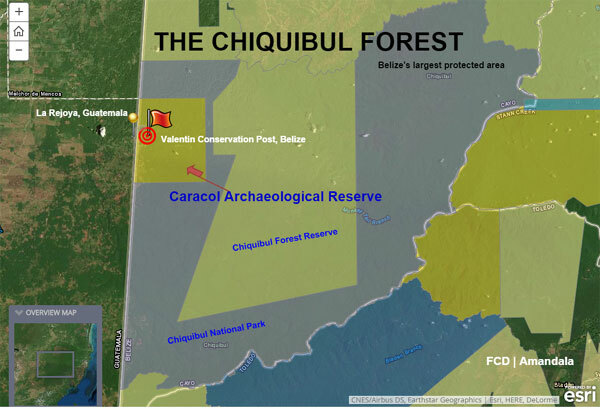 The three existing conservation posts in the Chiquibul are Tapir, Rio Blanco and Ceibo Chico. After the new conservation post at Valentin, two new posts will be set up: one at Caballo, further north, and the third at Cebada. 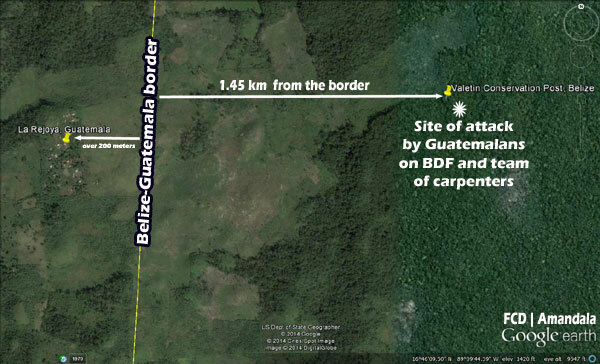 Why not build these posts closer to the Belize-Guatemala border? CEO Lovell said that the parties, Belize and Guatemala, had agreed that there would be no new construction within area declared or agreed to be the adjacency zone, 1 kilometer east and west of Belize’s border with Guatemala, although Belize still maintains all its rights and privileges up to the border. He said that the new conservation post at Valentin is well within Belize, 1.45 km away from the border, and so Guatemala should have no reservations. The village of La Rejoya, said Lovell, is located 200 to 500 meters away from the border, on the Guatemalan side. 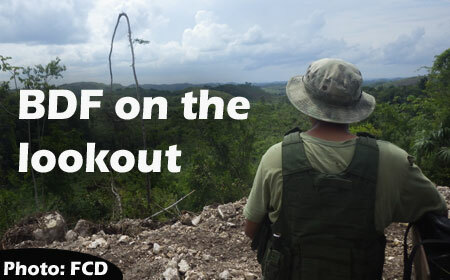 Lovell confirmed that there have been several flare-ups between the Guatemalans and Belize military, including several incidents inside the Chiquibul Forest and further south inside the Columbia River Forest Reserve, another hot spot for illegal activity. 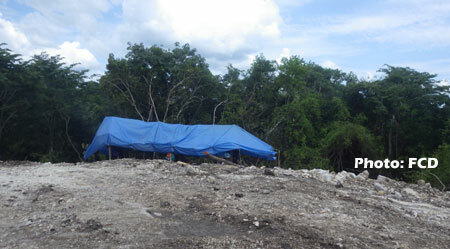 As our newspaper reported back in March 2010, Belize’s attempt to construct an observation post at Machaquilha on the Belize side of the border, to stave off similar illegal incursions by Guatemalans, was met with firm resistance from officials in Guatemala, who accused Belize of militarizing the border. Guatemala alleged that the conservation post was a political strategy to demarcate the border long ahead of the resolution of the case by the International Court of Justice, according to Belize’s then Ambassador to Guatemala, H.E. Alfredo Martinez. The official challenge to the erection of the Machaquilha observation post came after Guatemalan villagers of El Carrazal lodged official protests to their government. We had reported a few years earlier on an armed face-off at one of Belize’s other conservation posts. In that incident, a Guatemalan platoon of about 30 armed soldiers and 60 machete-wielding farmers, presumably from Monte los Olivos, about a mile from the Belize-Guatemala border, crossed over the border in the Rio Blanco area, traveled 600 meters inside Belize to the conservation post, demanding the return of two Guatemalan farmers who they alleged had been falsely detained. “We’re trying to put ourselves in a position where if they try to implement those threats, they will be dealt with. Any attempt at force on their part will be met by a response that will show them equal or in fact greater force,” he asserted. 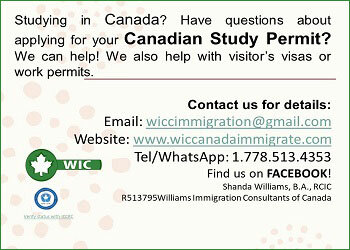 Click image to see story map. 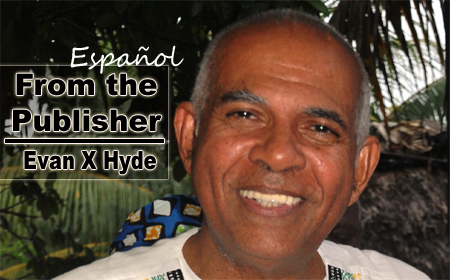 On Friday, political aspirant of the Opposition People’s United Party, Gilroy Usher, Sr., and his son, Gilroy Usher, Jr., led a protest in front of the Guatemalan Embassy in Belize City. Protesters carried placards and threw eggs at the Embassy. Opposition Leader Francis Fonseca has distanced his party from the egging of the Guatemalan Embassy. The intruders said that their intention was to destroy the conservation post, but they retreated to the Guatemalan side of the border after various verbal exchanges with the Belize military. “The BDF has since quickly deployed re-enforcement and is firmly and completely in control of the area, and construction of the conservation post continues,” the official release said. It noted that our Foreign Ministry has communicated to Guatemalan authorities our outrage at this blatant armed incursion by Guatemalan civilians. According to the release, both Guatemalan and OAS officials have been dispatched to the Guatemalan village to try to de-escalate tensions in an area, well known for lawless behavior. “Guatemalan authorities have been asked to do all in their power to dissuade civilians from any further such actions, as the Belize military will carry out its mandate to protect the sovereignty and territorial integrity of Belize,” the release said. It also noted that the international community is being alerted to this latest incursion, occurring on the heels of the execution of Special Constable Danny Conorquie last week by Guatemalans. “Every diplomatic effort will be used to ensure that the international community is fully aware of the aggression by Guatemalan civilians in the event that our military has to respond with appropriate force,” the release continued. Prime Minister Barrow told journalists Friday that he had spoken with CEO Lovell, and he and the Commander of the BDF, Brigadier General David Jones, had just done a fly-over of the Valentin Camp via chopper. “They didn’t see the presence of the Guatemalan civilian invaders, and so their sense is that these people have now gone away, but it is quite clear that their earlier presence was in furtherance of a threat that the villagers in the nearest adjacent village had made that they will burn down the observation post or the conservation post,” Barrow said. He announced that the BDF had dispatched reinforcement from the Incisive Gallop exercise, which combs the area every few months. “Hopefully it’s under control now, but it is still fluid. They know what they are doing when they come into Belize, and they know exactly where they are when they come into Belize,” Barrow affirmed. The Belize People’s Front, which led a border protest in response to Conorquie’s murder late last month, said that it will unveil a plan of action at a press conference scheduled to be held from 10:30 a.m. to 1:00 p.m. on Wednesday, October 8, 2014, at Aguada Hotel in Santa Elena, Cayo. Belize People’s Front said that it is outraged not only by the Conorquie execution at Caracol, but it is equally outraged that since that brutal murder, Guatemalans continue to accost Belizeans in their own land. “The Government of Belize—which is charged with protecting our sovereignty, integrity and our borders from illegal incursions—has failed and is impotent to do anything to safeguard Belizeans from such illegal activity by Guatemalan citizens,” it added. Amandala was unable to reach sources at the Institute of Archaeology, to ask them about plans to assign wardens or rangers to the new observation post inside the Caracol Archaeological Reserve, which falls under the Institute’s jurisdiction. Lovell told us that the BDF will definitely find the human resources needed to man the site. According to Lovell, the construction of the site began near the end of September and when he was there a few days ago, he noticed that bulldozers and construction materials were already at the site. 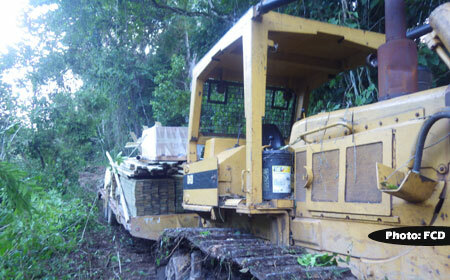 Works are being undertaken by Pine Lumber under contract with the Ministry of National Security. The building alone will cost roughly $90,000 to erect. On Sunday, an OAS mission traveled along with Guatemalan officials and met with the people of La Rejoya, and there was an understanding that the OAS would have assisted in putting programs in place for self-sustaining initiatives to reduce the need or the temptation for them to come across the Belize side of the border, Lovell said. He added that the Vice Minister in Guatemala’s Foreign Affairs Ministry, Oscar Adolfo Padilla, is scheduled to visit the location on Wednesday, to speak with villages to find out precisely what their needs are. He said that subsequently, Foreign Ministry teams from both countries will meet, if not later this week then early next week in Guatemala.